As more and more of you are transitioning from keeping chart notes on paper to utilizing electronic charting, we have been getting great feedback about what we are doing and suggestions for improvement. We are releasing some of those improvements with the June 2013 software update. The Exam Data Outline edit screen used to enter Additional Exam Data on perio exams and other clinical records has been updated to highlight the areas where text can be entered. We have also added some new capabilities to the editor used to edit chart notes using outline templates. Chart Note Overview - Most chart notes entered into the Datacon system are created using outline templates. An outline template includes optional blocks of text that can be included by checking a box. A block of text may in turn contain smaller blocks of text that can be optionally included. There may also be areas reserved in a template where you can type in specific details. Templates may also include merge fields that will insert existing patient information into the note. Examples include using a merge field to insert the patient's first name into a chart note or adding a date & time stamp with the user initials at the end of a note. There are a number of ways outline templates can be defined and accessed. Each chart note procedure can have it's own template. There are a number of diagnosis templates that can be assigned to procedures that should have diagnosis notes entered when treatment plans are entered. There are also a number of treatment templates that can be assigned to procedures that require detailed treatment notes. Visit notes describe the overall patient visit and usually include information that is not specific to procedures on individual teeth or areas. Visit notes might contain information such as patient demeanor, oral hygiene, anesthetics used, post-op instructions, etc. For each procedure, times can be assigned to each task to allow the scheduler to automatically calculate the time requirement for a visit. Outline templates can also be assigned to each Clinical Task. 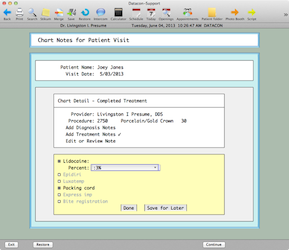 At the end of the visit, the software automatically creates an outline template with just the parts needed to document the patient visit based on the treatments performed. If the templates are carefully designed, little or no editing will be required to document the visit thoroughly. Chart Note Update - When editing notes using templates in earlier software releases, you could only type into spaces that were reserved for text. If there was a possibility that multiple lines of text might be typed into the template, the template required space to be reserved for each additional line of text. The new software makes it possible to expand the text area while it is being filled in. You can insert or remove lines in a text area and when you are typing the software will automatically wrap and expand the text box when the cursor reaches the end of the field. This change simplifies the design of the outline template and reduces the amount of space that must be reserved on the screen for text boxes. Outline templates frequently are designed to provide an assortment of choices of adjectives that describe some condition or treatment. In the past, these might have been shown as a series of checkboxes titled with options like "Early, Moderate, Severe" or "Light, Moderate, Heavy". With this new software these can be set up in a way that shows these choices in a pop-down menu instead of next to check-boxes. These two changes allow more of your choices and text to be visible at the same time and simplify data entry. After an outline template has been filled in the software automatically builds a paragraph using your various choices. Our users have indicated that there are many times when it would be useful to save a partially completed outline to be finished later or by someone else. The software now includes an option to save a partially completed template. When this is enabled, a pair of buttons is displayed at the bottom of the template offering the choices "Done" or "Save for Later". An attempt to exit from the template without making a choice will lead to questions about your intent. A template may be edited as many times as needed but once you are done and it is converted to a note there is no going back.